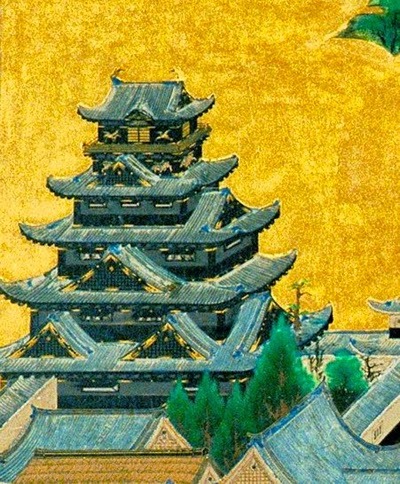 Japanese castles (城, shiro) were fortresses composed primarily of wood and stone. They evolved from the wooden stockades of earlier centuries, and came into their most well-known form in the 16th century. Like European castles, the castles of Japan were built to guard important or strategic sites, such as ports, river crossings, or crossroads, and almost always incorporated the landscape into their defense. Though they were built to last, and used more stone in their construction than most Japanese buildings, castles were still constructed primarily of wood, and many were destroyed over the years. This was especially true during the Sengoku ('Warring States') period (1467-1603), when many of these castles were first built. However, many were rebuilt, either later in the Sengoku period, in the Edo period (1603-1867) which followed, or more recently, as national heritage sites or museums. Today, there are around fifty castles extant, or partially extant, in Japan; it is estimated that once there were five thousand. Some castles, such as the ones at Matsue and Kōchi, both built in 1611, remain extant in their original forms, not having suffered any damage from siege or other threats. Hiroshima Castle, on the opposite end of the spectrum, was destroyed in the atomic bombing, and was rebuilt in 1958 as a museum. Originally conceived of purely as fortresses, their primary purpose being military defense, Japanese castles were originally placed in strategic locations, along trade routes, roads and rivers. Though castles continued to be built with these considerations in mind, for centuries fortresses were also built to serve as centers of governance. By the Sengoku period, they had come to serve as the homes of daimyo (feudal lords), and served to impress and intimidate rivals not only with their defenses, but with their size and elegant interiors, architecture and decorations. Oda Nobunaga was one of the first to build one of these palace-like castles, at Azuchi Castle in 1576; this was Japan's first castle to have a tower keep (天守閣, tenshukaku), and it inspired both Toyotomi Hideyoshi's Osaka Castle and Tokugawa Ieyasu's Edo Castle. Azuchi served as the governing center of Oda's territories, and as his lavish home, but it was also very keenly strategically placed. A short distance away from the capital of Kyoto, which had long been a target of violence, Azuchi's carefully chosen location allowed it a great degree of control over the transportation and communication routes of Oda's enemies. Famous folding screen about the construction of a castle from the Momoyama period. Click on the thumbnail to see the details, in Japanese. It took lot of people to built a castle. The technical groundwork, water ways and stone walls were in the supervision of the fushin bugyoo 普請奉行, whereas the architectural works, buildings, watchtowers (yagura) and parks (goten) were in the supervision of the sakuji bugyoo 作事奉行. It took Lord Moori 13 years to have the castle constructed, and it was finally finished in 1616. But in 1874 it was destroyed. Now we can still enjoy the stonewalls with 1000 cherry blossoms in spring. A new white watchtower was finished two years ago. 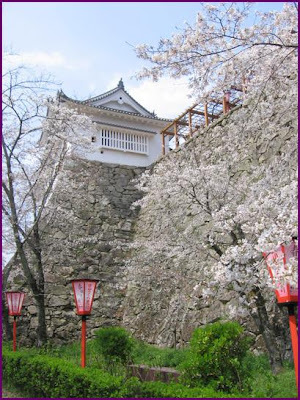 Take a walk in Tsuyama Castle with the Cherry Blossoms, 2007 ! Nagoya Castle is the preeminent symbol of Nagoya. To bring back the vibrant colors of 400-year-old artworks on the partitions that adorned the interior of the Hommaru (Castle Keep)Palace, the full-scale restorative reproduction project was commenced in 1992 (Heisei 4). This exhibition will captivate visitors with not only the artworks, but also the restorative reproduction process itself. In commemorative of the restorative construction of Hommaru (Castle Keep) Palace from January 2009, we will exhibit major works such as those in the entrance, the Omote-shoin (main drawing room) and the Taimen-jo (reception hall). With the 400th anniversary of the battle and fall of Osaka Castle almost upon us, and despite being one of the iconic scenes of Japan, Osaka Castle's current Tenshu, a ferro-concrete tower reconstructed in 1928 is historically, very inaccurate, incorporating an interesting mix of old and new, and of differing clan and colors. It was constructed based on the shape and design of the Toyotomi period Osaka Castle, but built on top of the 1620's reconstructed Tokugawa period Tenshudai, or tower base --a completely different shape! The original Osaka Castle featured black walls and dark grey roof tiles, but the current castle has been built in the white walled, green copper-sheet roofed design preferred by the Tokugawa clan. The Current Osaka Castle's uppermost floors have been painted black on the exterior, and golden decorations of tigers and cranes have been painted on to better resemble the original Toyotomi period castle. 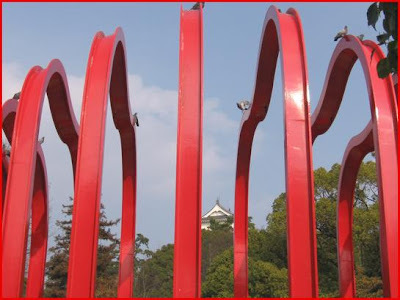 Despite it being a Tokugawa castle by appearance, it features the Toyotomi crest in various places. - - Toyotomi Period Osaka Castle. Incidentally, the Tokugawa Osaka Castle keep was constructed 50 meters west of the original Toyotomi period keep, and so the positions too are different. The only thing correct about the current concrete keep is that it has 5 floors on the outside, but 8 floors inside. The Toyotomi and the Tokugawa keeps both had 8 floors too. So, could Osaka Castle not be reconstructed? No. Not accurately. The reasons? First, Osaka would have to choose whether they wanted the Toyotomi or Tokugawa keeps rebuilt. The Toyotomi keep's base was destroyed by the Tokugawa in the 1620's, although the land is now left vacant. No plans for the original castle keep exist, which poses the biggest problem. If they chose to build the Tokugawa period Osaka Castle, the shape and size would be smaller than it is now, and again, as this was destroyed in 1665. No plans remain of the Tokugawa period castle either, and as no photographic evidence remains, by law, the castle cannot be re-built. One positive side to Osaka Castle, 13 original Tokugawa Period structures remain, and have been designated as Important Cultural Assets. Japanische Burgen / Shachihoko - der "Giebelkarpfen"
. Osakabe no kami おさかべの神 / 刑部明神 Osakabe Myojin . Highway Service Area "Soba Castle"
TONOSAMA 殿様, Lord of the Castle. There is also the possibility to make your own buckwheat noodles there. The first TENSHU was constructed by Oda Nobunaga, who felt himself as the "Lord of the Sky"
This site is a Guide to the 136 castles in Japan. 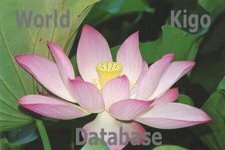 My aim is to make this the most authoritative and comprehensive site available in English on Japanese castles. The leaders of a group of soldiers, for example foot soldiers 徒組, soldiers with bows 弓組 or soldiers with rifles 鉄砲組. The system of "five are a group", goningumi 五人組 had a leader for each group. The headman of a village was also called this way, or 長(おさ)百姓. 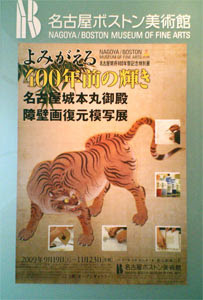 There are many books about these officials in the Edo period. This hokku is from the fifth month (June) of 1823, when Issa was in and around his hometown. The location seems to be a castle town in a rural feudal domain in the general area of Issa's hometown. Usually rain is plentiful in June, but apparently it has been dry in this area this year. The headman and assistant headman of a nearby village in the domain are making their way toward the domain castle gate dressed in formal robes, even though it has begun to rain. Presumably their helpers are holding up umbrellas for them, or perhaps they ride in palanquins. Issa only gives hints, but the word order suggests that the most likely reason for this sudden formal visit to the castle is to report on something related to the rainstorm. Since their visit seems to be occasioned by a sudden downpour, it seems likely that the village earlier held a shamanic prayer ceremony, perhaps with singing and dancing or even a trance, asking for rain and dedicated to a local god or gods. Such festival-like prayers for rain were quite common in Issa's time, and they are still carried out occasionally in contemporary Japan. In this case the prayers seem to have been "answered" very dramatically, and the village officials hurry to inform the daimyo lord of the domain or, more likely, his representative of their success. It's not clear whether Issa believes in prayers for rain or not. He may be satirizing the way the village headman and the assistant headman seek to claim credit for what nature or the gods brought about and the way they try to curry favor with the domain lord. Probably a formal report isn't even needed, but the two village officials are trying to dramatize the situation and use the rain to promote themselves to the domain lord. because of the winter sleet . . .
the castle tower looks higher than the autumn sky." about the ruins of Inabayama castle 稲葉山城. KYOTO – Parts of stone walls and gold-plated roof tiles believed to be the ruins of Shigetsu Castle have been discovered at the construction site for a new apartment complex in Fushimi Ward, Kyoto, a private research firm has announced. Feudal leader Toyotomi Hideyoshi began construction on the castle in 1592, a year after he ended his regency. But it was called a “phantom castle” because it was said to have been destroyed by an earthquake in 1596, and no remnants had ever been found. Researchers have excavated some 36 meters of stone wall about 0.5 to 1 meter high and 2 meters thick, more than 100 fragments of gold-plated roof tiles, and the remains of a 5- to 7-meter-wide, 2-meter-deep moat, according to Kyoto-based firm Kyoto Heian Bunkazai. At the 滝不動 Fudo Waterfall at 滝沢神社 Takizawa Jinja priest Mongaku had placed a Statue of Fudo, which he had made himself. There were also tow old cedar trees, Tarobo-sugi and Jirobo-sugi. In the year 1609 when large pillars were needed for the rebuilding of Sendai castle these two trees were felled and should be transported to Sendai. But the boat sank to the ground near Natorigawa and the two huge tree trunks were lost. So now they are called "the sunken Taro and Jiro, 太郎礁 Tarone and 次郎礁 Jirone. Positions for lower Samurai, involving for example cleaning and keeping the castle of Edo and its gardens clean. The character 御 o expresses respect for the group.